A few years ago Tibor Arodján suffered a stroke. He recovered quite well, but one arm remained weak and his speech got a bit slurred. It meant the end of his carrier as a builder. Luckily for him, Arodján found Teszt, a company that offers jobs to people with, as the Hungarian law calls it, ‘changed abilities’. They gave him a job in their hothouse, where he grows chrysantiums for All Saints Day and primroses for Womens Day. Arodján feels lucky. He loves his work and he realises very well that he could have ended up at home, living on minimal state support, with no chance for a job. Nobody in Hungary is eager to employ a handicapped builder. State support for companies that employ disabled people is very limited. That means that for those who, physically or mentally, are not able to compete on the commercial job market, chances to find regular employment are very slim. That used to be different untill 15 years ago. The communist state-run economy guaranteed full employment and thus offered virtually everybody a job. As long as people were not too seriously disabled they had the chance to own their own bread, often even in a normal state run company. For those with more limitations there were workplaces in sheltered workshops which were run by the local governments. Teszt is the commercial successor of that system. The company owns eight sheltered workshops in several towns and offers jobs to some 600 people, physically as well as mentally disabled. Not all of them have ‘changed abilities’, which actually means that they used to have a regular job which they lost because of health problems or as a result of an accident. Part of the Teszt-employees were born handicapped and never had any employment before. According to Hungarian law, companies get a subvention for the salaries of their employees if they employ at least 70 percent of handicapped people. That means that only specialized institutions like Teszt ever qualify for this kind of state support. Take for instance Gabriella Szőke, who lost her whole stomach to cancer. She works at the administration and is very capable in her job. Although officially, she is 67 percent disabled, she works seven hours a day. But she has to eat small amounts at very regular intervals. If she forgets, which is easy without a stomach as she never gets hungry, she rapidly looses wheight. If she eats a bit too much, she gets ill and starts vomiting. Few employers are ready to deal with that. On a sunny October morning at the workshop in Dunakeszi, a woman sits in front of the building, smoking a cigarette. She makes a relaxed impression and obviously sees no reason to flinch, just because one of the companies directors is approaching. On the contrary, she starts to chat and asks Frajna about his children. These little breaks belong to the normal routine of life at Teszt. Nobody expects her to work constantly. After all, if she could, she probably would have a regular job. In Dunakeszi, Teszt has a hothouse, a carpenters workshop and a welding workshop. Some people do gardening for the local government. Other are employed in the companies offices. But most of the employees do simple, manual jobs: packaging, assembling pumps for soap bottles, producing plastic bags. The work is mostly commissioned by companies. The Dutch logistic company Rynart is one of the few companies who recognized that strength. Amongst its other services, Rynart offers co-packaging and repackaging, like putting the Hungarian stickers on imported chocolate bars. Since a year, part of this work is done by some 60 Teszt-employees who work at the Rynart premises in Biatorbágy. In the beginning, Rynart saw it as an experiment, because the company wanted to make sure that the Teszt-people would be able to meet the companies deadlines and quality requirements. It worked out that well that Rynart decided to let Teszt do a big part of the repackaging. Rynart-employees who did that work before, in the meantime have been reassigned to more demanding jobs. The idea behind Teszt is to rebuild self-esteem and teach people to get into the rhythm of a normal job. Some of the people have been unemployed for more than ten years, before they find their way to the company, through the job agency of the local government or just because somebody told them about Teszt. The ultimate goal is to help them find their way back to a normal job. In practice, though, only few succeed, as the reality of the competition elsewhere turns out to be too hard. Quite a few of those who switch to a regular job, eventually come back to Teszt. Loosing their job would be a disaster for most Teszt-employees. It often would mean social isolation and in most cases utter poverty. In Hungary, disabled people are devided in three categories, those with 40, 50 or 67 percent disability. Only the last group qualifies for a full pension, normally somewhere around 50,000 forint per month. 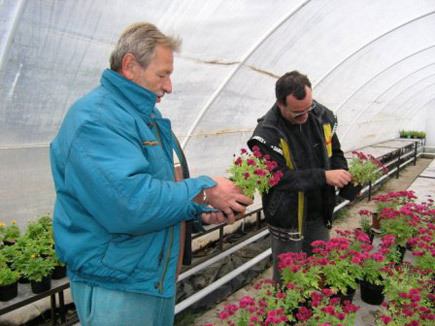 People who are less disabled get some 20,000 forint monthly and are only able to survive with the help of their family. For them, a job is sheer necessity.